Spot on assessment, Peter. My biggest gripes were with the finger strength protocol. Repeaters are great for strength endurance, but for hard boulders I prefer one arm or minimum edge hangs. I've found the crossover endurance gained from those to be plenty for bouldering without sacrificing power for the sake of unnecessary endurance. I also found it curious that limit bouldering wasn't explained in more detail. They want you to do 'hard moves' but fail to delineate the precise nature of said difficulty. There is a enormous difference between small limit moves on bad crimps/feet and enormous limit moves (dynamic) between edges. To be fair. you could write a small book just focused on the nuances of limit training, but a few parameters on programming specific difficulty would have been nice. 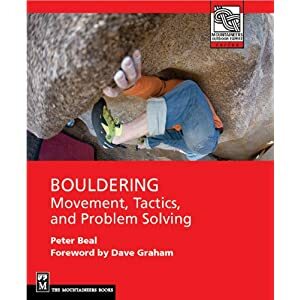 The inclusion of a bouldering chapter was nice, but sport climbing was the clear focus of the book. These guys just aren't boulderers. This is most evident in their seasonal training plan for an 'advanced boulderer'. The strength/power partitioning is fine, but the performance phase focuses on outdoor mileage. The only time I've ever gone for mileage is 1) first days in a new area on the road and 2) on days with poor conditions. I'm not suggesting mileage days are useless, but when i'm close to my 'peak' i'm typically trying limit moves on hard boulders.... all day. Overall this was a nice addition to the library, but like you said the training for bouldering book has yet to be written. Thanks for the great feedback! I think an accurate mapping out of productive "limit" effort is really important both in training and actually trying hard on boulders. I tell my coaching clients that finding that period of peak effort and recognizing that's when to start winding down is a critical part of smart injury-free training and projecting. Spreading out limit effort across different muscle groups and kinds of movement is important too, as you suggest.